The Knowledge Management (Marine Policing) team invited a retired Superintendent, Leung Wai-shing, to give a sharing session under the Experienced Officers Exit Debriefing Series. More than 50 frontline officers attended the event at the Marine Regional Headquarters on October 26. Mr Leung had served in the Sea Standards Division of Marine Regional Headquarters and was responsible for the monitoring of navigation and seamanship standards of Marine Region. 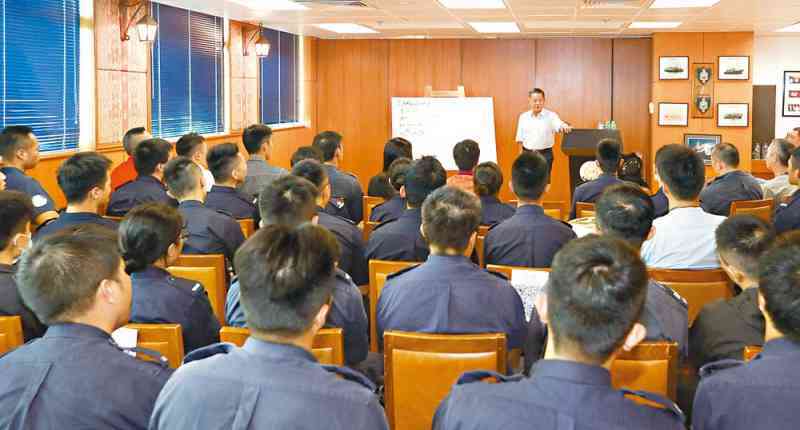 At the sharing session, Mr Leung shared his 30-year-plus experience in maritime policing and practical seamanship. He highlighted the importance of building a strong foundation of seamanship. He also shared his experience in handling marine incidents to help maintain the professionalism of Marine Police. Mr Leung was very pleased to have the opportunity to share his practical experience with the young generation of the Region. The attendees were inspired a lot by his sharing. This would be beneficial to pass on professional knowledge and techniques in seamanship to the young generation.